Bob Alford; 2011; Aviation Historical Society of the Northern Territory; soft cover; A4; 261 pages; many photos including a rare colour photos of the Clyde Barnett Collection taken in 1942. Revised and vastly improved edition of a book first published in 1991. Indeed this is virtually a new book compared to the original. It remains the most authoritative work on Darwin’s air war, and has been compiled from a wide range of sources worldwide, including Japan. This edition contains many new photos, most of them from private collections. 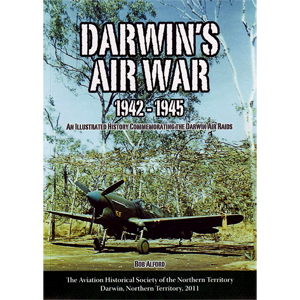 The entire scope of Darwin’s air war is covered, beginning with the pre-war defence build up. After the Pacific War began, Darwin was a key staging post in attempts to reinforce and defend Java, but this ended with the massive raid on 19th February 1942. This was the first of many raids, and the table at the end of the book has been updated to include not only raids but reconnaissances, some of which were previously unrecorded (Japanese records have added much to this volume). Soon greatly aided by radar, Darwin was defended first by USAAF P-40s of the 49th Fighter Group and later by RAAF and RAF Spitfires of No.1 Fighter Wing. As Allied strength steadily grew, offensive strikes were flown against the Japanese in Timor and surrounding islands by an assortment of types including Hudsons, Beaufighters and B-25s (including by No. 18 Dutch Squadron). Eventually USAAF and RAAF Liberators ranged deep into enemy territory. All in all this is a fascinating account of war in a theatre often overlooked. The book also includes a series of profiles which describe the experiences of pilots of several different nationalities. It is well foot-noted throughout and contains a lengthy list of sources.